See the full classes schedule. Expires 4 months after purchase. Limit 1 per person, may buy 1 additional as a gift. New customers only. Mandatory booking required at least 48 hours in advance. Check availability and book here; provide Groupon code. Present Groupon on arrival. 48-hour cancellation policy. Must be 16 or older, unless accompanied by an adult. Please register and answer waiver questions using TeamUp website prior to the first session. 5 passes must be booked and used within the validity of the voucher. 5 classes must be used by the same person. Voucher will be redeemed on first class. Sportswear only; trainers must be worn. Studio opens 17 Sep 2018. Bookings for classes available from 3 Sep 2018. Excludes bank holidays. Valid for option purchased only. 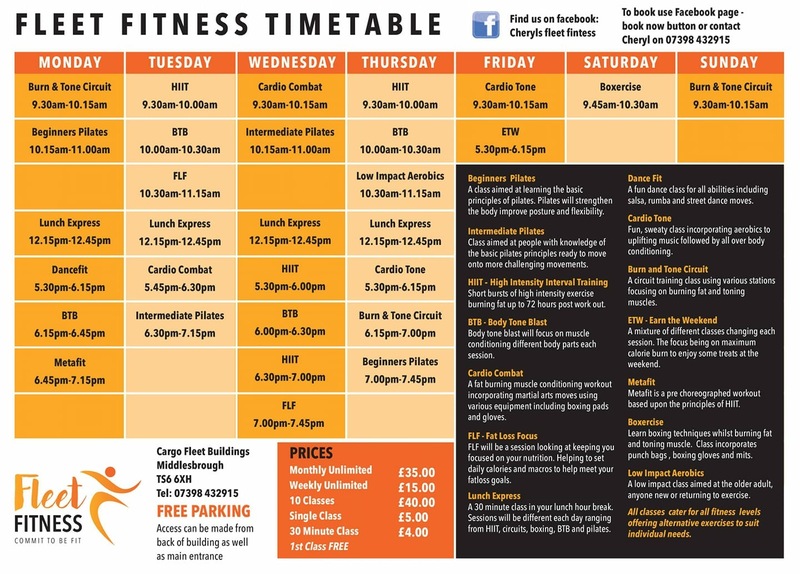 Located in Middlesbrough, Fleet Fitness offers its customers a variety of fitness classes, such as Pilates, cardio tone or fat loss focus. The team of professionals at this spot may take care of both beginners and those who have had contact with fitness before.